Duchess Anna in Bavaria married Baron Andreas von Maltzan on Friday in a civil ceremony at Schloss Tegernsee. 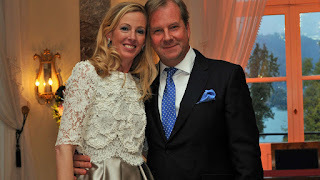 This is the second marriage for fifth and yungest daughter of Max, Duke of Bavaria and his wife, Countess Elizabeth Douglass. Anna, 40, was married in September 2007 to Klaus Runow. This marriage was dissolved by divorce earlier this year. Duchess Anna has two sons, Heinrich, 5, and 3-year-old Johannes, from her first marriage. Baron Andreas von Maltzan, 50, is a photographer and artists. The first reports of a romance between the couple appeared earlier this year, when Anna accompanied Andreas to the opening of his exhibit of photographs. About 170 guests attended the reception at Schloss Tegernsee.